Outside a Tower Records store in Manhattan, a chorus of screams is going up. Mostly sopranos and altos, a few tenors and no basses. Riiiiiickyyyyyyyyyyyy! I love you! Five thousand fans, mainly young women, have gathered to catch a glimpse of the latest heartthrob, their coraz�n. Those at the front of the line enter the store and stumble out with a signature scrawled across a CD or on a poster or even on their skin. Some leave crying tears of joy. At a multiplex across the street, Fox is holding one of the first screenings of The Phantom Menace. You can see a flicker of hesitation on the faces of a few Phantom ticket holders. I thought I was in the red-hot center, the flicker seems to say. What's going on over there? Ricky Martin is what's going on. The hip-shaking Latin pop star has the No. 1 song in America, Livin' la Vida Loca. His self-titled new CD has sold half a million copies in Asia since its release a month ago; a repackaged version of his previous disc, Vuelve, sold more than a million copies in the region, not counting Japan. And Martin is at the center of something bigger than himself. A host of other Hispanic performers, including vocalist Marc Anthony and actress-turned-pop diva Jennifer Lopez are releasing high-profile, Latin-tinged CDs around the same time. Martin, in an exclusive interview with TIME, was so euphoric over his success he bordered on the Roberto Benigni-esque. What are you kidding me? says Martin. I'm flying! I'm flying! 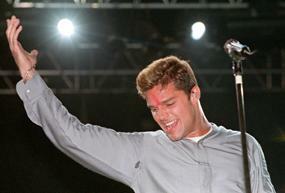 Ricky Martin is a fresh face--but not an entirely new one. For 15 years now the 27-year-old singer has enjoyed a kind of second-tier level of fame: he was a member of the teen group Menudo, he once co-starred in Les Mis�rables on Broadway, he has appeared on the U.S. TV soap opera General Hospital. The cultural wave Martin is riding--Latin pop--we must admit, is also not an entirely new phenomenon. Salsa, rumba, mambo and other Latin musical forms have made a dent in global pop music--Celia Cruz, Rub�n Blades, Gloria Estefan, Ritchie Valens, Los Lobos, Antonio Carlos Jobim, Machito, Willie Col�n, Tito Puente and many, many others have, for decades now, scored hits, excited crowds and pioneered new sounds. TIME's discovering Latin pop would be a bit like Columbus discovering Puerto Rico. as the century turns to double zero, a new generation of Latin artists, nurtured by Spanish-language radio, schooled in mainstream pop, are lifting their voices in English. Of this group, Martin is the hottest; Lopez, 28, the most alluring; Anthony, 29, the most artistic. Latin-tinged pop is blowing up because it fits the musical times: it has a bit of the street edge of hip-hop (Lopez worked with rapper Sean [Puffy] Combs on one track on her CD), some of the bouncy joy of dance-pop (Martin is hunkier than all the Backstreet Boys put together) and the fizzy fresh feel of that ever sought-for thing in modern pop, the Next Big Thing. None of this could have happened 15 years ago, says producer Emilio Estefan, husband and manager of crossover trailblazer Gloria Estefan. Gloria and I went through the hardest part. A dozen years ago, a label threw me out when I tried to use congas on a recording. They said, 'Get rid of that, and take out the horns and the timbales too.' Now people are buying records by Arturo Sandoval and Buena Vista Social Club. The younger generation is now reacting to Latin music. Because Latin pop draws from different cultures, it also has the power to bring people together. Latino people have a golden key in their hands, a common treasure, says Colombian-born pop-rocker Shakira, 22, who is working with Gloria Estefan to adapt her acclaimed 1998 Spanish-language CD D�nde Est�n los Ladrones? into English. That treasure is fusion. The fusion of rhythms, the fusion of ideas. We Latinos are a race of fusion, and that is the music we make. And so at the dawn of a new millennium, when everything is said and done, what could possibly happen besides a fusion? Puerto Rico is where it all started. It is an island inhabited by the descendants of black slaves and Spanish conquistadors; here cultures collided, rhythms intermingled and salsa emerged, inspired by Africa and Europe and New York City. Marc Anthony's parents hail from the island, and Jennifer Lopez, though born and raised in the Bronx, also has roots there. As for Ricky Martin, he was born in Puerto Rico, the son of Enrique Martin, a psychologist, and Nereida Morales, an accountant (Martin's parents separated when he was two). Look at Martin today, and you can tell he was a child star--he wears the spotlight like ordinary folks wear house slippers. Indeed, Martin got started early: at 12 he auditioned to join Menudo, a Latin singing group comprised of boys ages 12 to 16 whose roster rotated when members grew too old. Martin was rejected on his first try because he was too small and too young-looking. Martin tried out again. Rejected again. On the third try, he made it. It was an early sign: what Martin lacked in talent he made up for in pure doggedness. He was small, not a big singer and his voice was not so good then, recalls the group's manager, Edgardo D�az. But we thought he could learn a lot by being with the group. Martin was immediately caught up in Menudo's vida loca. He visited Italy, Japan, Guam and Spain before he was old enough to shave. During one stretch, he and his young bandmates played for a month in Brazil (singing in Portuguese), then flew to the Philippines (singing in English) before returning to Latin America for a series of shows in Spanish. Life became a blur. Not surprisingly, perhaps, Martin's home life suffered--both his parents wanted to see more of him, and his father asked him to choose between the two. Hurt and angered by the ultimatum, Martin stopped talking to his father for almost a decade. A few years ago, they reconciled. Over the years reports have surfaced that the social and emotional lives of the kids in Menudo were poorly supervised, even neglected. D�az will admit only that the group did have problems, though he denies he was the root cause. Says D�az: I think a lot of problems come from the house, from the family, some of the parents the kids have. Martin, D�az says, actually fared better than most. Ricky had that special personality, like a charm, says D�az. He could handle himself. In fact, Martin dreamed of breaking out of the group's constraints and setting off on his own. Producer-performer Robi Rosa recalls talking to Martin about his ambitions when they were both in Menudo: Mainly our conversations were about life and being true and making it and doing something great. After finally leaving the group at age 17, Martin embarked on a commercially successful Spanish-language solo career. He was signed by Sony, which early on saw a future in Latin pop (Anthony, Lopez and Shakira are all on various Sony labels). Says Sony Music chief executive Tommy Mottola: The heart and soul of the music will be able to break down barriers easily. It's undeniable. Sony had that faith confirmed well before the current bout of Ricky-mania. Back in December 1997, the label's deputy marketing chief for Asia, Andrew Yavasis, received an e-mail pitch from his Latin America counterpart about Martin. I said to myself, 'God, does this guy even sing in English? Why does he want to come to Asia?' But, says Yavasis, the singer insisted that he felt spiritually connected to Asia. (Martin now closes every concert by clasping his hands in a namaste.) Martin's having been chosen to sing the 1998 World Cup anthem, La Copa de la Vida, gave Yavasis some hope: Sony went ahead and repackaged Vuelve with the Spanglish version of Copa and Martin's hit, Maria. MTV was happy to play along. We identified him as a product who might have a great marketplace here in Asia, says MTV's Asia programming director Mishal Varma. I'd be lying if I didn't say that the man surpassed anything we had anticipated, concedes Vijay Singh, chief executive of Sony India. In New Delhi his posters are sold on street corners with those of Indian gods and goddesses--both film and mythological--and his music is even edging out bhangra pop at weddings. In Japan, Martin's songs have tapped into a craze for things Latin . When the singer agreed, against Yavasis' advice, to perform at a fashion industry trade show last September in the Chinese city of Dalian, more than 50,000 people turned up in the local Workers Stadium. Of course, Martin's popularity in places like Seoul and Jakarta derives in part from his dominance of the U.S. charts--the traditional source of cool for Asian teens. And the American market wasn't easy to crack. But his pelvic-swiveling rendition of Copa at the Grammy awards earlier this year proved a breakthrough. Martin had done the impossible: he had sung about soccer in Spanish and made Americans care. It's hard to imagine anything more far-fetched A French-language ode to cricket? At the Grammys, Beck stood and clapped. Madonna signed on for a duet. Martin's U.S. career was launched. Several publishers, including HarperCollins and St. Martin's, are already rushing out books on him. A lot of people say, 'Well, why English, why do you want to do it in the States? says Martin. It's all about communicating. The last album [Vuelve] did really good, to be quite honest--I want to be humble about this--all over the world. One of the songs was No. 1 in 22 countries. And it was in Spanish. So I didn't have to go to English to make it. But his timing--and we're trying to be humble about this too--was perfect. Record labels, eager for a hot new sound, have started to court Latin pop stars. The death of Tejano idol Selena in 1995 and the boom in her music that followed got many label suits thinking: If Selena can sell millions of CDs posthumously, how much money could we make with a Latin pop star who can still tour? Says Maria Zenoz, chief executive of Caliente Entertainment, a record company in New York City: The untimely death of Selena caused the mainstream labels to take a look. It's perhaps appropriate that the Latin female singer who is best positioned to grab hold of a Selena-proportioned success is the woman who portrayed her on film. Gregory Nava, director of the 1997 biopic Selena, cast Jennifer Lopez in the lead. The finished film used Selena's real voice for the musical sequences, but, Nava says, Lopez would sing through her scenes during the filming. The experience inspired Lopez to launch a singing career. I did a demo in Spanish after Selena and submitted it to the Work label, says Lopez. They said, 'We like it, but we want you to do it in English.' So she did. If You Had My Love, the first single from her debut, On the 6, stood atop the Billboard Hot 100 chart last week. Enrique Iglesias, who was rejected by several major labels at the start of his career but who has since sold more than 3 million CDs worldwide, recently got a call at home from actor Will Smith asking him to contribute a song to Smith's upcoming film Wild Wild West. Iglesias' English-language song Bailamos will be on the Wild sound track, and he is now considering recording a CD in English. But he says he will never leave Spanish behind. I gotta remember something--what got me here was Spanish, says the 24-year-old Iglesias, son of crooner Julio Iglesias. If it wasn't for my Spanish record sales, I wouldn't have these record companies after me. Still, some longtime aficionados fear that the new Latin pop wave could wash away important cultural connections. Esmerelda Santiago, author of the memoir When I Was Puerto Rican, says the current crop of singers being pushed by the major labels could use some skin-tone diversity. She feels the artists who are being promoted to superstardom mostly look Anglo, leaving the darker performers behind. It's fascinating to me, and a little upsetting, that this is still the white face of the Caribbean, says Santiago. I'm sure that there are equally talented and gifted artists out there whose facial features don't conform as much to the European ideal. In a studio in Manhattan, Marc Anthony is working on his new English-language album. He is dressed simply in jeans and a white T shirt, and his voice is ringing out, pure and direct. Sony chief Mottola sits in the control booth, listening, looking, betting on a hit. These are good days for Anthony: he recently completed work on a featured role in Martin Scorsese's film Bringing Out the Dead, co-starring Nicolas Cage. In a few weeks he'll begin recording a duet with neo-soul singer Maxwell. And Anthony's duet with Lopez, No Me Ames, is already a hit on Spanish-language radio. Yet he is unsatisfied. Although Anthony knows Martin well and is good friends with Lopez, he is wary of media stories lumping them into a single group. I don't know what they're talking about with this Latino crossover thing, he says. I could see it if I was doing a salsa album in English. But you know what? We're not doing Latin music on our English stuff. Latin-tinged, yes. judging from an early listen, sounds extremely promising. What makes him great is his commitment to make vocal art, not simply trendy entertainment. Martin, of course, succeeds by doing the opposite. His new CD is not high art, but it is the kind of relentlessly affable confection that transcends radio formats, crosses generations and sells like crazy. Lopez, too, is well positioned. Her voice is slight, but then again, so is Madonna's. Lopez's talent lies in its diversity--she sings, she can act, and, as a former In Living Color Fly Girl, she can dance. VH1 is already panting over her first video. Trends come and go, stars wink and fade out. How long will this new crop hold out? It's impossible to predict who will be a pop star forever, says Wayne Isaak, executive vice president of music and talent for VH1. But [Martin, Anthony and Lopez] could have a longer career than most. Even if their pop following wanes a bit, they will always have this Latin fan base that can keep them playing Madison Square Garden and working with the best producers of the day. And no doubt Latin music will continue to thrive as well. The Argentine writer Jorge Luis Borges once wrote a story about an empire so obsessed with maps that its cartographers constructed a map as large as the empire itself. Indeed, one by one, Spanish-language stars are being mapped, represented in another form. This new map will no doubt prove useful for Anglo listeners unfamiliar with the territory. But true music lovers would be well advised to check out CDs like Anthony's Contra la Corriente or Elvis Crespo's Pintame or Shakira's D�nde Est�n los Ladrones? in addition to any Latin-tinged pop CDs they might buy. There is real ground beneath the map.